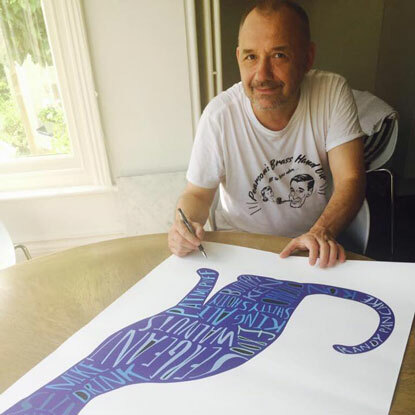 We’ve joined forces with comedian Bob Mortimer and online gift company Wordynumnum to auction a unique signed print to raise much-needed funds for cats in our care. 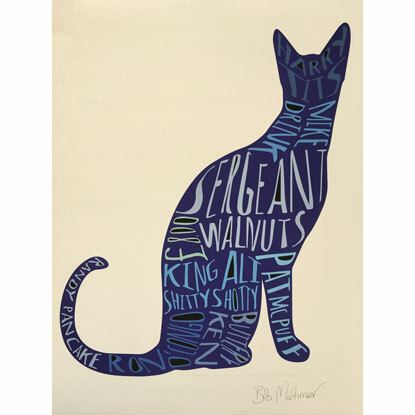 The A1 sized artwork is a one-of-a-kind design by Wordynumnum, who have been producing limited edition cat-name prints since July this year. As part of the collaboration, Bob Mortimer took some time out of his schedule to speak to us about the project. How did you get involved with Wordynumnum? It is a project that I do on the side. I first met Lisa and Roma, the owners of Wordynumnum, when they worked in the costume department at the BBC. They used to make suits for me and Vic Reeves years ago and were particularly creative. When I decided to jokingly ‘sell’ cat names on Twitter earlier this year, they began to use the names and make cat-shaped prints out of them. I’ve always had cats. I think the first one was probably named by my mum and was called Billy. From then on, I always had cats called Billy. Billy one, Billy two and so on and so forth. I’ve got two cats at the moment, both orientals – one tabby and one tortie. They are called Goodmonson and Mavis but I’m always naming them different things. I probably give my cats different names each day! What is it about cats that you love? I have always loved cats. Black-and-white cats in particular – the black cats with the little white collars. I love the way that cats often come into people’s lives and have often had cats that have serendipitously come into my life. The first one was a stray that followed me to school, the second cat was a kitten that unfortunately fell into a cellar. I found my third cat when I was living in a homeless hostel in London. Why did you choose to help Cats Protection? Although I haven’t got a particular connection with Cats Protection, as I say, I love cats. I thought it would be a good idea to donate the money gained from these prints to a cat charity. So far, we’ve raised a good amount of money – over one particular weekend, we raised over £3,000. Although there has only been a limited run so far, we’re hoping to increase the amount and raise lots of money for Cats Protection by the end of the year. If you fancy getting your paws on this unique piece of art, head to our website for more information. The auction will run from midday on Friday 24 November to Monday 27 November.